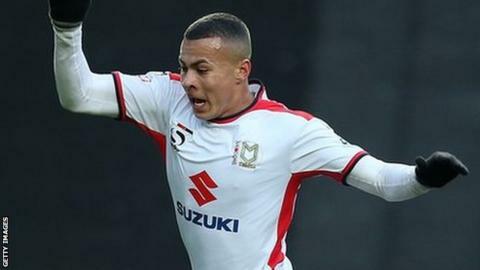 Dele Alli's £5m transfer from MK Dons to Tottenham will enable the club to produce more stars, says manager Karl Robinson. The 18-year-old locally-born midfielder completed a deadline day switch to the Premier League side on Monday. However, he will be loaned back to the Dons for the rest of the season as they seek promotion to the Championship. "Dele's money will create a legacy for kids in Milton Keynes," Robinson told BBC Three Counties Radio. "The chairman brought football to Milton Keynes and MK Dons play young boys that are now really shining." The deal for Alli also features add-ons, which include money for international appearances and a sell-on clause. The Buckinghamshire club will use the money to invest in new training facilities. MK Dons became the first professional football club in Milton Keynes 11 years ago, when owner Pete Winkelman controversially moved Wimbledon from south-west London. The club have since focused on producing youngsters from the local area, and from 2011 onwards, they have seen Sam Baldock - now at Brighton - go to West Ham, Sheyi Ojo join Liverpool, Wales international George Williams move to Fulham and Brendan Galloway sign for Everton. "If there wasn't a football club here, would George or Dele or Brendon have had somewhere to play? Well, no," said Robinson. "That's £11.5m we've sold now in four-and-a-half years. It's a lot of money. "It's all been internal players that we already had here or developed. I'm just as proud of that as the success of the team. That money for a division three side is incredible."